A man who lost use of his arm in a stroke has built his own bionic arm from scrap metal. 6 months ago, I Wayan Sumardana, who lives on the island of Bali in Indonesia, had a stroke and claims he was left with no feeling in his left arm and only able to move 3 fingers. 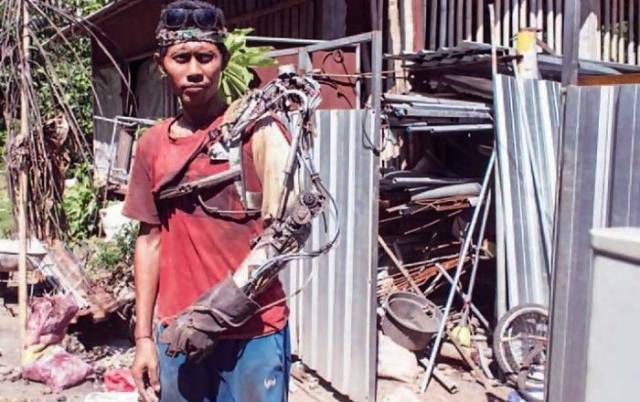 Worried he would no longer be able to provide for his family the 31 year old welder decided to be creative and construct a “bionic arm” out of scrap metal from his junk yard. He says that without his “bionic arm”, his left arm will just hang limp by his side. Now looking like an extra from a sci-fi film, Sunardna claims the arm, which he made after doing research on the internet, works by interpreting brain signals from his head. He says he can only use it for 4 hours a day after which he feels dizzy and nauseous. Experts have questioned his claims though, as they say there is no programming in his “bionic arm” to interpret his brain patterns into arm movement. Whatever the validity of the machine The Freaky applauds his ingenuity.